US Secretary of State Mike Pompeo on Wednesday praised the "change agenda" of the Democratic Republic of Congo's new president, Felix Tshisekedi, hailing his actions against corruption and other longtime scourges. 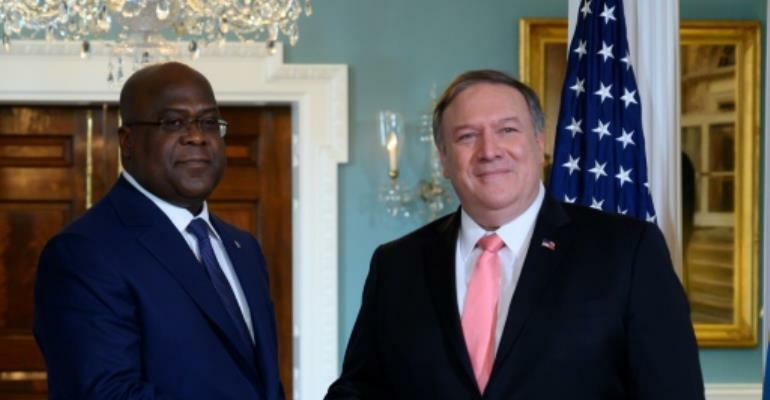 Tshisekedi, who took office in January in the vast country's first peaceful transition of power, met Pompeo in Washington on a trip where he also spoke to business leaders. Pompeo "expressed support for President Tshisekedi's change agenda focused on fighting corruption, strengthening governance, advancing human rights and accountability for human rights abuses and violations, promoting stability and security and attracting American investment in the DRC," the State Department said. It said that Tshisekedi committed to "good governance and respect for human rights." Tshisekedi's election was marred by allegations of widespread fraud, with rival Martin Fayulu saying the vote was stolen. But the international community quickly rallied around Tshisekedi after his election was validated, hoping to avoid the sort of unrest that has plagued the former Zaire since its independence from Belgium in 1960. Since taking office, Tshisekedi has taken actions that have won support in the West including blocking corruption-tainted senators from being seated and moving to repair historically tense relations with Rwanda.